Scrub sweet potatoes, but do not peel. Place potatoes in 3-quart saucepan. Add enough water just to cover. Heat to boiling; reduce heat to low. Cover and simmer 20 to 25 minutes or until tender. Drain; cool slightly. Slip off skins. Cut into 1/2-inch slices. Heat remaining ingredients in 10-inch skillet over medium heat, stirring constantly, until smooth and bubbly. Add potatoes. Gently stir until glazed and hot. 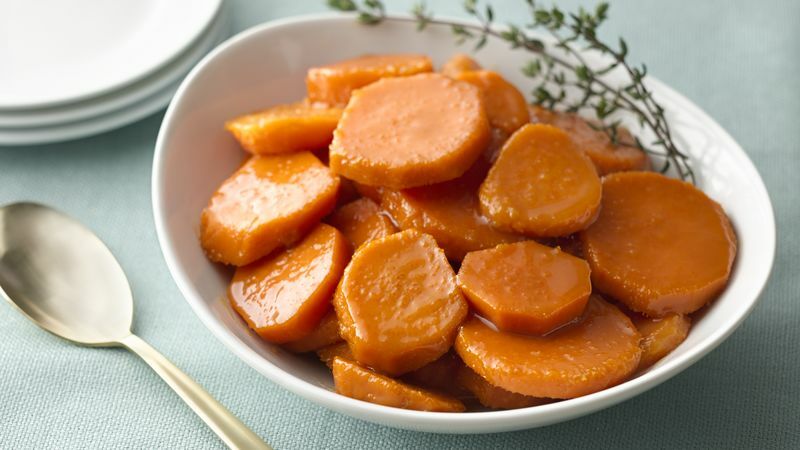 This recipe uses orange-fleshed sweet potatoes. If you have trouble identifying them at the store, use your thumbnail to scratch a bit of the skin off to reveal the color of the flesh. Some grocery stores now carry light-fleshed sweet potatoes, which are not the right pick for this recipe. Contrary to popular belief, yams aren’t grown or sold in the U.S. What you’ll find in the grocery are different varieties of sweet potatoes. The deep orange or nearly red-fleshed varieties are very moist and sweet, perfect for this brown sugar-sweetened side dish. Boiling the potatoes in their jackets makes peeling them a cinch—no veggie peeler required. Easily layer up the flavor by substituting orange, apple cider, or cranberry juice for the water. Make pineapple sweet potatoes by omitting the 3 tablespoons water and adding an 8-ounce can of crushed pineapple in syrup, undrained.